Its been nearly 3 months since the Stylify template. Now I am presenting my second template named Standardized. It has its roots in responsive design and has some awesome features like threaded Reply comment & eye-catching Header design. A mix of design and usability. The code for the menu widget has been separately included in the Download Package. Rather than integrating it into the Template and making it difficult to edit ,I have included it separately. All the styles are included beforehand just the Links have to be copied in. The menu should be in the section of the Header (being just below the Header). The Download package also contains code for these two widgets. Either you can put them in separate widgets or put them together. In case you put them together then make sure the search box is above the icons and also include it in the section just below the Header (In Page Elements/Layouts). The widget containing the Social Media Icon should always be in this section. This template came in the wake of many users complaining about different problems in the previous template. Cool template :) Thanks for the share.. :) You rock..
@Prayag Verma wowww thank's dude eheh. @DAROkay ,Try re-installing the template. If it doesn't work even then, then I suggest waiting for a period of 1-2 days as most of your post are very recent. It is very unlikely but there may be a issue with the indexing. I've changed the publish date of the posts and it works. How to paste code below header? Needed to download through proxy due to that STOP SOPA act. Firstly you will have to follow this post on how to make these comments into the Official Threaded Comments. Then you can directly apply the styles from the post you mentioned. on the W3c Validator and I got 17 errors and 6 warnings. did you make some changes? Yeah sry, was reading not enough on your awesome site. it shows bloger navigation widget in right side, how can i remove this? i have tried but cant succeed. also how to change blog title and description font and color and size? The test blog URL ? now please help me to change the blogger title font size and font itself? actually i want to reduce the font size and change its color. How to apply Blogger Threaded Comments in here tothis template, because I still have a problem with that. The threaded comment isn't working properly on my blog. Any suggestion to fix this problem? 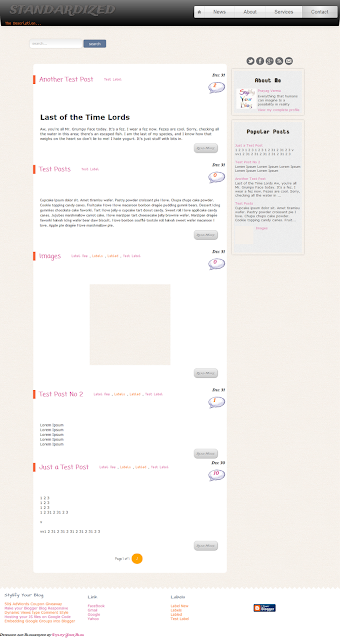 i have installed this template in my blog, its awesome. I am installing a widget, which says paste a code before div id='main-wrapper' code, but i couldn't find that code in this template, is there any alternate code available? i have also asked this to that gadget owner, but he has not replied yet, that's why i decided to post here as well. If you want to add another button then assign it another class ,like button1 and then in the HTML give it class="button1"
i can't rename class name i want to add because its a css file and iam not author of this file, so it would be easy for me if i can rename your button class. Are you there? i need reply for above query. thank u, i changed it. Could you post tutz how to apply that in this template ? I messed up with the arrangements.. Pls help asap ! can you plesae tell how to add auto read more to this template ??? Write Search Engine Optimization Tips please.